While the EVV mandate is a part of the federal 21st Century Cures Act, many states, like Ohio, have added additional requirements for providers to follow in order to be EVV compliant. The Ohio Department of Medicaid describes EVV as “an electronic system that verifies when provider visits occur and documents the precise time services begin and end”. Ohio has encouraged that all affected agencies have completed the certification process by January 8, 2018—a year before the national deadline. As the deadline looms closer in Ohio, it’s important for all relevant states and private health care businesses to be up-to-date on how to navigate EVV requirements in their state. An agency in charge for several other agencies needs to begin the certification process for each individual agency, each creating their own provider ID. Providers are encouraged to complete the certification process 60 days before January 8, 2018 deadline. Thus, providers should complete the process by November 9, 2017 in order to allow adequate time to train their staff and adjust to the system. Mobile applications now have the ability to efficiently improve your business’ field service operations by simplifying the collection of data in the field. Modern Software solutions are able to completely replace paper-based forms with digital forms accessible via smartphone app in any working condition. 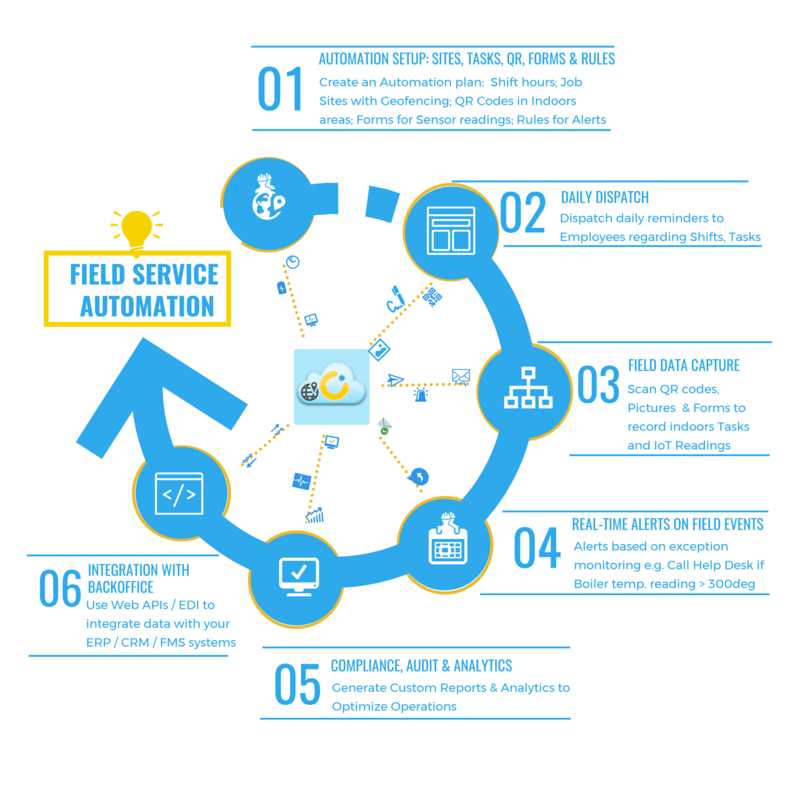 One of the greatest advantages that mobile solutions offer is the ability to customize field data collection based on just-in-time field operations needs. The flexibility offered by creating, editing, and sharing forms in real-time establishes mobile forms as an advantageous supplement in diverse field-tech industries. Forms that meet federal and state healthcare regulations can be created to ensure effective practices in client interaction. The requirement for all health care providers to use Electronic Visit Verification (EVV) by 2019 has inspired mobile applications to best assist in this growing need. Healthcare Effectiveness Data and. Information Set (HEDIS) Gaps analysis requires providers to visit members and gather non-clinical data. Then, gathered data is is used to create a care plan. Valid place & time stamp on such forms creates audit logs and verification of visits- thus facilitating billing and avoiding fraud. The use of mobile forms offers a simple, portable solution to record employee time, log use of materials, collect proof-of-service etc at geofenced work sites. Recorded data is organized easily using forms and stored in the cloud in near real-time thus removing any risk of lost data in fast-paced work days and shifts. Signatures and marks of approval can be edited in real-time instead of being transported with risk of human error. Facility managers and maintenance crew can benefit from form and data sharing in real-time in handling unforeseen complications. Facility managers and maintenance crew would have the ability to collect equipment readings in the field and trigger immediate alerts if maintenance and repairs are required. Shifting to a mobile forms solution can simplify a number of your daily tasks and business processes. Saving time and money is only the pinnacle of the advantages mobile capabilities can offer. This entry was posted in Mobile Workforce Management, Uncategorized on - by myGeoTracking. In the peak of the hot summer season, The Occupational Safety and Health Organization (OSHA) is reminding affected businesses and their employees of their continuing campaign to combat heat illness for outdoor workers. In educating employers on the guidelines in place, employees experience a lesser chance of suffering from harsh outdoor work environments. The following tips exemplify how both keeping your employees safe and complying with OSHA standards can be facilitated using only powerful mobile workforce management apps on your mobile devices. Constant updates from managers regarding the change in temperature of their work site allow outdoor workers to take the preventative measures that are best suited for the specific heat index. These temperature updates can be shared manually when managers check the temperature at frequent intervals and use in app messaging systems to inform affected workers. Another option that is simpler and less time-consuming than manual weather updates is through automated alerts. Alerts can be automated to send out a warning to workers when the temperature reaches a threshold– like in the State of California, where state labor laws require employees to be notified when the temperature goes above 95 degrees. OSHA assigns providing clean, palatable water as an employer responsibility. Businesses should provide their outdoor employees with clear access to water at their designated sites. Aside from providing water, managers are responsible for reminding their workers to drink water throughout their shift. A general guideline for the high-risk level heat index (103 to 115 degrees) is to drink four cups of water per hour. It would quickly become difficult and excessive if managers were to hourly remind each employee to stay hydrated. Instead, using automated alerts through their mobile app, outdoor workers can be notified of a change in temperature and act accordingly, in this case, drink more water, based on the information on heat-related safety they’ve been given. In the case of a heat illness emergency, medical care should be conveniently accessible for outdoor workers. Through the use of in-app messaging and real time location services, managers can be immediately informed of an incident and seek immediate medical attention. Having the most accurate location of field workers allows first responders to ensure a timely response to a heat-related injury. Periods of rest are highly encouraged by OSHA guidelines, and in states like California, they are mandatory. When the temperature reaches 95 degrees, the employer must ensure that the employee takes at least ten minutes of total break to cool-down every two hours. Having a preconceived rest schedule is important for any business, but having a system that allows you to automatically contact your field workers when a change in temperature requires a change in break schedule offers greater flexibility and caution. Making changes to work schedules to avoid high-risk heat is made easier with the use of app based alerts that can automatically notify mandatory breaks based on weather changes. Businesses should educate their employees on heat illness protocols related to their specific work. Based on the temperature and the specific protocol, employees can responsibly prevent heat illness among themselves and their peers. Automated temperature updates sent to employee phones encourages employees to act on protocols they are familiar with instead of their managers being responsible for constantly reminding them what to do. OSHA suggests that supervisors check in with heat-exposed employees several times an hour. The ability to message and send pictures, forms, and more in-app allows for constant communication between employees and their managers. Using one app platforms relieves supervisors of the headache traditional means of using multiple devices, numbers, and methods to reach employees often causes. Simple, effective communication that can be enabled at any time is key to being vigilant despite volatile changes in the heat index. myGeoTracking is a cloud-hosted, carrier grade location and messaging platform that helps SMB and Enterprise businesses better manage their mobile employees by improving productivity and accountability, while reducing payroll and operations costs with solutions such as GPS tracking & time clock, Lone worker safety, Automation of field activity monitoring, Mobile forms & data collection including signature, notes, pictures, barcode/QR code etc. The myGeoTracking platform enables these solutions across a wide range of industries such as field service management, trade services, emergency responders, sales reps, transportation & logistics and home health care providers. The advances in mobile and cloud technologies and the increasing popularity of smartphones and smart devices with built-in GPS chips allows businesses to easily expand location services to its workforce (the employees) and gain valuable insights on field operations. The recent normality of GPS location services in employee management has encouraged business owners to better understand the relationship between employee privacy rights and employer rights to accountability and productivity. Phones used in location tracking can either be the employee’s personal phone or provided by the employer. Both scenarios cause many to ask the question: How do businesses track their employees without crossing ethical or legal boundaries? Using cloud-based location services for employee management offers comprehensive benefits for businesses in the field service industry. The increased productivity from both employers and employees caused by automating operations and logistics results in major savings for a company of any size. Features like mileage tracking and real-time dispatch response further cut costs. Support for Electronic Visit Verification (EVV) requirements, overtime calculation, and rest regulations. A mobile workforce software offers the best solution to ensure businesses follow legal guidelines for complex labor laws. The knowledge of real-time location, job status, and availability helps streamline operations and increases the overall productivity. Some of the best solutions, like the myGeoTracking.com can help automate any field operations workflow by letting businesses define their operations logic and workflow based on an IFTTT (if this then that) sequence. So, on one hand, employees have a right to their privacy. On the other hand, businesses also have a responsibility to maximize productivity and efficiency for all stake holders i.e. customers, employees, vendors etc. During work hours it is critical for businesses to improve the performance of employees who are in the field performing vital tasks such as field customer service, freight deliveries, property management and emergency response etc. Acknowledge state laws regarding employee tracking. While GPS tracking of employees is still relatively new and thus not commonly addressed in State and Federal laws, some states enforce general employee privacy guidelines to abide by. Modern tools offer strong privacy features that empower business operations with real-time status information about the employees during work hours without compromising privacy. Having an open communication with employees on this topic and providing them the flexibility to manage their privacy is a good place to start. Rigid guidelines should be set that abide by HR policy. Mobile workforce management services like myGeoTracking can become a new force multiplier to not only help you better manage your seasonal workers, but also help you build a consistent culture of accountability and efficiency across your entire business on a year-round basis. Website to generate a QR Code: http://www.qr-code-generator.com/.